This afternoon, I had a pre-scheduled meeting with Justine Blue (Kinloch’s City Manager) as a follow-up from our previous meeting back in June. Next year will commemorate the 70th Anniversary that Kinloch was incorporated as Missouri’s First Black City. She informed me at our first meeting that Kinloch used to hold festivals in the park and its been on my mind for the past two months to speak with her about bringing festivals back into the city. On my way to meet with her, I drive past Kinloch County Park which is located directly behind City Hall. 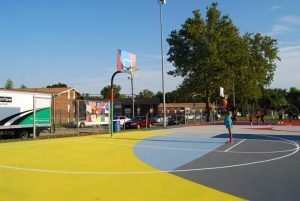 I notice the basketball court had been freshly painted in many different colors, trucks parked in front of the court, and several people with camera equipment scattered throughout the court. Me being me (extremely nosey), I find somewhere to park and get out to see what was going on. 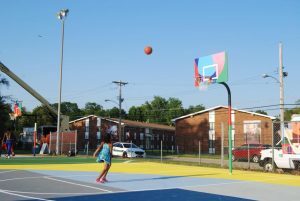 Come to find out, the people standing around were from a local production company shooting a commercial of Kinloch locals playing basketball on the newly remodeled basketball court. 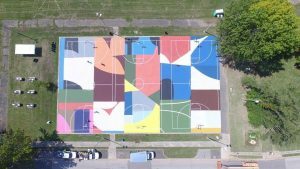 Project backboard, an organization that uses public basketball courts as a canvas for creative expression in order to strengthen communities and inspire multi-generational play, partnered with a local artist named William LaChance to design the masterpiece that you see above. 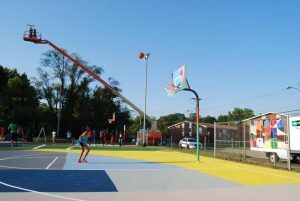 The unveiling of the court was later that afternoon and locals were invited to come see the court, fellowship, and eat free food followed by some pick-up games of basketball. I saw a little bit of everyone there – current residents, former residents, local officials, old and young…. It literally felt like a family reunion. I used this as an opportunity to connect with any and everybody. Share my vision for this city and the film for anybody who even cared to listen. Made more contacts with others who were interested in sitting down with me and sharing their story about their time in Kinloch. And to think, I wasn’t intending on passing the basketball court to get into Kinloch and I would have totally overlooked the court and missed that entire event. What started as a 30 minute meeting ended up turning into a night of fellowship in the city that my bloodline began. 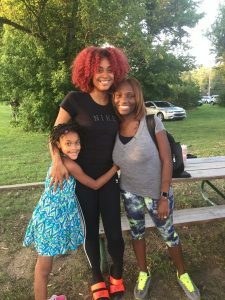 The part I enjoyed the most was seeing my daughter engaged and enjoying herself. She went from, “I’m ready to go home” to “Mommy, did you see me with my friends?” I know Kinloch has never been and probably never will be home to her (just like it wasn’t for me), but I want the name to be as familiar as possible to her so she will have a sense of comfort anytime she hears me talk about it or go visit. I want family origin and community to make sense at the age of 8 rather than 27 (like me). The way that things have been going (candid, unplanned, and fruitful), I know I’m on the right track. The playground was concrete. 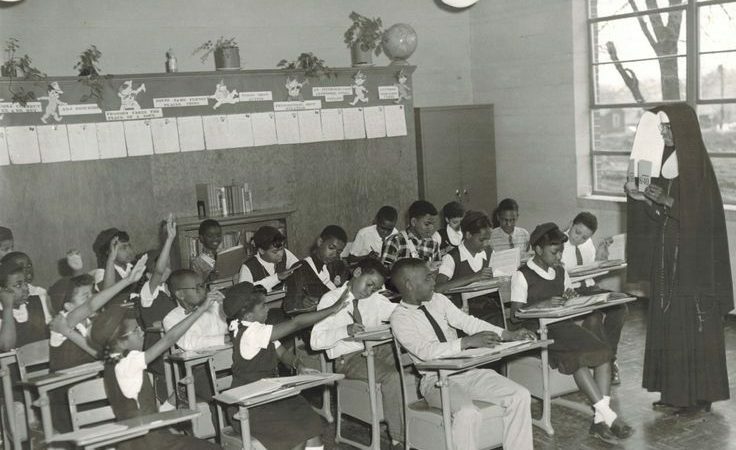 In the 1990s, the all-black Catholic school, which nested within a once-flourishing farming community, now had no vegetation in sight except for the grass within the gated yard of the rectory where the white priest stayed. At recess, kickball was the main event.